In one of our previous posts, we mentioned that we avoid highly cyclical stocks. The reason being that we are not good at evaluating cyclical businesses and because these businesses have unpredictable earnings and cashflows. Instead we prefer sticking with known great businesses & simple companies. But, just a few days back, a highly cyclical business caught our attention. The business was Steel. And the company was Steel Authority of India Ltd. (SAIL). We found SAIL available at Rs 68 apiece (March 15, 2013). This seemed a little too cheap at first. We then checked the historical price movements and found that it was indeed available close to its multi year lows [see graph below]. Now, a price close to multi-year lows can mean few things: Entire economy is in midst of a once-in-a-generation-recession OR Company has everything going against it OR Company is nearing bankruptcy (or similar financial outcomes). But as far as we could make out, neither is India facing a really big crisis, nor is SAIL nearing bankruptcy. And the graph below clearly shows that though slow, the sales are increasing. Also, the operating and net profits are falling in last few years. That is a red flag. But considering that entire economy is struggling to gain momentum, a cyclical business like steel is bound to pay the price with declining profits. Once we had it confirmed that SAIL is not about to close down, we decided to check simple parameters like Book Value, Price to Book Value Ratio & Dividend Yields. And what we saw only confirmed our initial thoughts. The stock is trading not only close to its multi-year lows, it is also trading at valuations (P/BV) which have almost never been seen before for this company!! SAIL is available at its lowest P/BV ever!! We also found that in past, book value per share had almost always acted as a very strong support for the stock price. But same has changed recently. The stock has consistently traded below its book value for last 18-20 months. It may be due to negative sentiments attached to commodities and economy in general, but we are not sure. We analyzed the stock on another parameter which we love a lot – dividends. And once again, we were not surprised. Being a PSU, it has been quite generous with its dividend payouts. As of now it is available at mouth watering 4.2% Dividend Yield. Historically, it has had an average dividend (%) of 28%, which seems sustainable in the long term. So we come back to our original question? Is it a good time to buy / accumulate shares of SAIL? We feel that though a lot of indicators point that it may be a good time to start accumulating this stock, a little further analysis might be needed before deciding to start accumulating this stock. We take up the second and last part of our analysis in our next post. Disclaimer – Created positions recently in SAIL. Disclaimer – Author had a short stint in steel industry. A 9-Year Case Study of an investment in ONGC & why it is available close to its historically cheapest valuations? Some time back, we did a post on ONGC’s dividend history. Since, we hold this stock in our long term personal portfolio as well as Dead Monk’s Portfolio, we thought we could (or rather should) give it a deeper study. We were debating on how to go about it, when we came across a great post by Joshua (link) analyzing an investment in Starbuck’s IPO. We really liked the thoroughness with which the investment was analyzed. This prompted us to take a similar approach to evaluate ONGC. Caution – This is a long and number intensive post. ONGC’s IPO came sometime in first half of 2004. The price band was initially set as Rs 680 – Rs 750. And retail investors were offered a discount of 5%, i.e., shares were allotted to them at Rs 712.50 (non-adjusted as of today price). Retail category comprised of those who invested less than Rs 50,000. The proceeds of the share sale were going to Government of India and not ONGC. What a Rs 50,000 investment in company’s IPO would have turned into over a 9 year holding period? We look at all aspects including capital appreciation and dividends. We also try simulating results of another approach where we make regular investment in ONGC’s stock over this 9 year period. We also look at how ONGC has increased its book value per share over these years and how it can be used to make decisions about when to enter this stock for long term. We also evaluated why the above approach might fail. What a Rs 50,000 investment in company’s IPO would have turned into over a 9 year holding period? Suppose you had Rs 50,000 to spare in 2004. You decided to invest in ONGC’s IPO as a retail investor. The shares were sold at Rs 712.50 apiece to retail investors. You received a total of 70 shares (rounded for ease) for your investment. First of all, after these 9 years, your 70 shares would have grown to 421 shares as a result of 2 bonuses (2:1 and 1:1) and a split (from face value of 10 to 5). At a market price of Rs 320 (at time of writing this post), your stocks would be worth Rs 1,34,737. To top it, you already know that ONGC is a generous dividend payer due to government’s mandate. This means that in past 9 years, you would have received 19 dividend payouts totaling a sum of Rs 30,035. (Edited to add): The Sensex returns would be higher than 14.87% if we also consider the dividends issued by the constituent companies. Note – John D. Rockefeller was the richest man ever. More than 10 times richer than the current richest man!! You can read about him and his company Standard Oil’s story here. What a Rs 10,000 investment every quarter (3 months) in ONGC’s stock would have turned into over these 9 years? This approach is born out of our interest in disciplined investing. Suppose you decide to invest Rs 10,000 every three months in ONGC’s stocks. This can be considered similar to having a regular SIP (Systematic Investment Plan) in mutual funds. This approach would have resulted in you investing Rs 3,50,000 in last 9 years. Result? First of all, after these 9 years of quarterly investments, you would own about 1656 shares of the company. At, current market price of 320, these shares would have a value of Rs 5,30,077. Apart from that, these shares would have earned a total of Rs 73,828 as dividend income. That is, your total investment of Rs 3,50,000 has turned into Rs 6,03,906. What has been the trend in Book Value per share for ONGC in last 9 years and how this data can be used to decide when to invest in the stock? The company has been growing its book value at a decent 13.6% (CAGR) for last 9 years. The great thing about this growth is that it has been uniform, i.e., all yearly increases have remained in the range 11-15%. The above trend shows that the company has been successful in increasing its book value over the years. You may question this as the book value can be rigged. Also there are much better parameters available for valuing oil exploration businesses But lets just delay that discussion for a while. So, now what we have at our hand is a company (ONGC), operating in a capital intensive business of oil exploration, which has consistently grown its book value in last nine years. The blue line is a plot of P/BV ratios of ONGC’s stock over the years. As we can see, the lowest which it has ever reached is P/BV=1.62. The highest it ever went was in late 2007 when it hit 4.14. The average in last nine years has remained at 2.51. So, when the stock was trading in the band 1.6-1.7 in late 2012, it was one of the cheapest multiple (P/BV) at which the stock could have been possibly bought!! Nevertheless, government’s deregulation news pimped up the stock and now you can see the abrupt rise in blue line near the end of graph. The stock is headed towards its mean. And this is a historical pattern. Any stock cannot remain far off from its historical averages for long durations. There is always a regression towards the mean. As far as our personal portfolio is concerned, we bought a few ONGCs near Dec 2012, when it was available at one of its cheapest valuations ever. J So is this the right method to decide whether to buy a stock like ONGC or not? Because there are many other factors which play an important role in deciding whether to purchase a stock or not. We look at a few which are relevant in this context. Why the above approach should be taken with a pinch of salt? What are the possible loopholes in this approach? The above approach relies entirely on the stated book value of the share. And book values can be inaccurate because they do not always reflect the true networth of a company. This can be attributed to use of different accounting methods for items like depreciation, which can significantly affect the book value. Oil exploration companies like ONGC offer a unique problem of valuation due to their large value based on oil reserves. There is also a large uncertainty in many of the assumptions, such as value and quality of their reserves. So, unless and until this data is taken into account, a comprehensive analysis of oil stocks cannot be done. Other oil and gas specific metrics includes valuation based on barrel of oil produced per day, etc. The above book value based approach does not give any weightage to the management team (appointed by Govt. of India in this case). Experience is crucial and ONGC has loads of it. But with ageing oilfields and increasing complexity of newer projects like ones taken up by ONGC Videsh (& its Imperial Energy fiasco), this aspect should be given its due importance. Another issue with this approach is that it does not evaluate alternatives available within the sector. For example, there are other explorers like Oil India Limited and Cairn (India), which sometimes offer higher growth potential due to better reserve quality. Its common knowledge that most of ONGC’s oil fields are ageing and in no position to increase their output. Such questions on future growth potential, in wake of lack of new oil finds, can also be attributed to lower P/BV multiple being assigned to this stock in last year and a half. Oil & Gas companies are generally complex to value because of above mentioned limitations. But they offer solid investment vehicles for safety of principle, long term growth and consistent dividend payments. 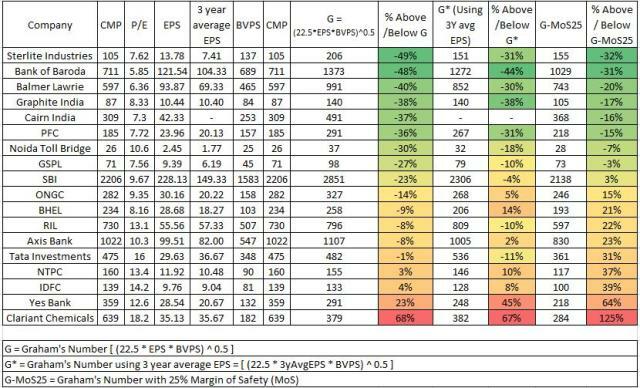 The above approach uses just one parameter P/BV to evaluate the stock. You as a reader, should remember that this is just a case study. Real life is much different from case studies. One should never invest based on just one parameter. This case should not be taken as an investment recommendation. Do your own due diligence before deciding about where to invest your hard earned money. Disclosure: Long term positions in Cairn India & ONGC.